Summary of the causes of Shays Rebellion: The Shays Rebellion, led by Daniel Shays, erupted between 1786 -1787 in Massachusetts. The causes of the revolt, which became known as Shays Rebellion was money - or the lack of money. The American Revolutionary War had resulted in massive War Debts. The Continental Congress and state governments imposed a Poll tax to pay for the Revolutionary War debts. Profitable trade with the West Indies was stopped by the British. Gold and silver became scarce and paper money was printed. Pro-debtor polices were adopted including "tender laws" and "stay laws". The dollar drastically de-valued, people were forced to barter. The poll tax was based on the same head tax, regardless of income. The poor farmers of Massachusetts were unable to pay the taxes, their lands were sold and many were thrown into debtors prison. For detailed events see Shays Rebellion. The Revolutionary war was over but was no strong national government with the power to smooth over the differences between the states. The Continental Congress had begun drawing up the Articles of Confederation in 1776 but there were long delays that made it impossible to form a strong government. To pay for the enormous war debts, massive taxes were imposed on the people. The poll taxes, based on head counts rather than income, were equivalent to one third of people's incomes. The prosperity of the northern states was largely based on a profitable trade with the West Indies but the British government ended the trade. No gold and silver came to the United States from the West Indies but constantly left the country to pay debts due to British merchants. Gold and silver grew scarce. There was no strong national government to compel the people to pay the war taxes. There was no strong national government to compel the British government to open its ports to American trade and commerce. American people called upon the state legislatures to print paper money. Many state governments started to pursue pro-debtor policies that forgave debts and printed more money. The policy of printing money (we now call this quantative easing) worked to some extent in states like Virginia, New HampshireNew York, Pennsylvania and South Carolina. The policies were disastrous in Rhode Island and Massachusetts. The state legislatures printed large quantities of paper money. They paid the public expenses with it, and sometimes lent it to individuals without sufficient security for its repayment. The paper money devalued, inflation soared. Flour that was $5 a sack rose to $10 a sack and then increased still further, paper money became practically worthless. Prices of basic commodities rose to such an extent people were unable to buy necessary food and supplies. By 1780 the paper dollar was only worth one-fortieth of a cent in gold or silver. The situation led to a depression in Massachusetts. Distilleries closed, ship building stopped and farmers had no buyers for their harvests. The poll tax was 4 times greater in Massachusetts than in states like New Hampshire. And the poll tax was based on head tax which was the same for all citizens, regardless of income. Poor farmers were therefore the hardest hit. The poor farmers were unable to pay the taxes. Their lands and personal possessions were sold at public auctions at far less than they were worth. Many were thrown into Debtors prisons. Causes of Shays Rebellion: "Tender Laws"
There was uproar. Demands were made for "tender laws." The "tender laws" enabled people to tender (offer) paper money in exchange for basic commodities such as flour. The "tender laws" of some states made it lawful to offer paper money or goods in payment of old debts which had been made when gold and silver were still in use. The "tender laws" made things worse. Traders went out of business and shops were closed. Merchants pressed for payments of debts before the paper money became totally worthless. Causes of Shays Rebellion: "Stay Laws"
The "tender laws" led to the introduction of "stay laws". The "stay laws" prevented people who were owed money from enforcing their rights. The effect of the "stay laws" was to close many of the remaining businesses that had managed to survive. The people and traders resorted to bartering. Laws were passed forcing people to accept the paper money, even stopping people from voting if they refused to accept paper money. Causes of Shays Rebellion: The article on the Causes of Shays Rebellion provides an overview of one of the major documents published just before his presidential term in office. 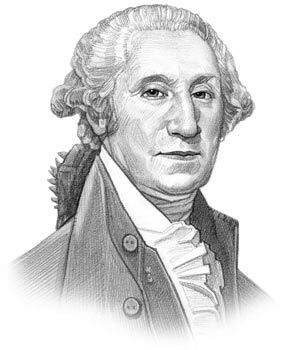 The following video will give you additional important facts and dates about the political events experienced by the 1st American President whose presidency spanned from April 30, 1789 to March 4, 1797.